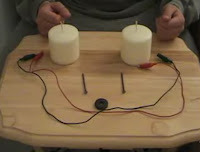 Amazingly, electricity can be generated by using just 2 candles. Not too sure about the logic behind this though. Watch the demonstration after the jump. This is clearly a fraud. There is no source of current from a candle's flame that can light even a small bulb. Other red herrings: briefly rubbing a nail with a magnet doesn't magnetize it; wax is a great insulator - no current would flow through it; the fact that the wires are partly out of view when the bulb is lit is suspicious. I assume that the small motor had its own internal battery. Finally, consider that if this were in fact possible, it would be a VERY popular demonstration for kids' science classes. A search for similar "candles producing electricity" videos from other sources results in nothing. I compliment the author for his fine work as a magician, but as a 'C' student in physics, even I know it's a joke. A hoax? Probably. But since fruits can be used to power a clock, it just makes me wonder whether this is possible too. I'll try this thing today, anyway. Hidden, off course. This works through the Peltier-Seebeck effect, a means by which differences in heat can generate electricity. It is true that the wax may act as an insulator, but when it is heated by lighting the candle, an electric current is generated in the the nail/screw/whatever AS A RESULT OF the increase in candle temperature. Here's a link where you can find more info on the Peltier-Seebeck effect. Thanks for the explanation Mikey! Mikey: if the nail was hot enough to generate current, it would melt the wax and fall out of the candle. Wax is a great insulator, otherwise the whole candle would melt as soon as you lit it. Sorry, back to physics class with you. I'm afraid you're wrong Mikey. The Peltier-Seebeck effect is indeed a way to make current flow through temperature difference, only in this clip the loop isn't closed, the nail is not hot (The melting explanation above), the heat couldn't even get there that fast. Out of my own selfdoubt I might try it just to prove myself right, but I think I can assure you, this is a hoax. Hoax. When the camera switches to the close-up when he rubs the magnet on the nail, he changes out the candles with ones where the nails are connected behind or under the candles to form a circuit. look, there's something underneath the table, since whenever a device is switched on or off, one hand is under the table. I think he has induction coils in the candles, or he has replaced the candles. For the light to light up, there must be a flow of electrons through it. For this to happen, there must be some reason why electrons want to flow from one nail to the other, and not vice versa. Since both candles are basically identical, there would be no reason for electrons to flow one way or the other. Anyone who thinks this is possible needs to get away from the SciFi channel and pay closer attention in school. BTW would you like to buy a bridge in Brooklyn? Did you know that the word gullible isn't in the dictionary? 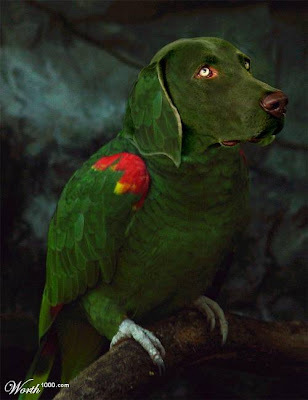 Seriously... some of you people are simply acting foolish. One of his hands is always underneath the table when the light and motor comes on and off. This isn’t even a magic trick, it’s just simply lame. It is a hoax. Watch the video closely when the bulb lights up he has his hand under the table also the bulb lights up before the second candle is lit at (2:25). When doing the motor he also switches the lighter to his other hand and then places the other hand under the table. Why would he need to switch the lighter to the other hand??? Nails are pushed into candles further after "magnet rubbing" break in film. Also, leads are moved at this time as well. Presenter's hand moves below table (to flip switch) just before candles are lit. Holes drilled in bottom of table and candles, connected to nails with circuit completed below table. What A waste of time. ...and mine too. Will avoid this site in future.